Looking through the listings for the year so far at the Leamington Assembly and it’s smaller sister venue the Zephyr Lounge there are plenty that for me really standout, here are a few I would highly recommend and hope very much to get to myself. Played a scorching show at the venue last year and a perfect band for the Zep fan in most of us, all the classics and a few surprises thrown in. Regulars over the last few years at The Assembly this amazing Thin Lizzy tribute band always impress and will I am sure fill the Zephyr and with the likes of ‘Jailbreak’, ‘The Boys Are Back In Town’ and many of the classics from the mighty Lizzy songbook this will be a fab night. This show by the blues icon last at The Assembly on his Battle Scars tour in 2015 (this was not long after his serious health issues and he played an absolute blinder) is a must, plenty of power, buckets of charisma and a blues master class on the guitar is guaranteed. Another great blues rock act making a very welcome return to the Assembly, for me playing a combination of classic rock and blues turned up to 11 and it is no wonder they are doing so well in recent years and held in such high regard. Have a listen to their sensational 2015 album ‘Reaching For the Light’ if you need convincing. Have not seen this one but after missing out on the real thing last year at Coventry and reading a few of the positive reviews on this tribute act I think this one is well worth a shot. Another band I have not see but I have heard very good things about this Polish Prog Rock band. The big one, an all day Prog Rock fest with the addition of a charity rock auction with all manner of signed and other rock memorabilia, acts confirmed so far Lonely Robot, Touchstone and Ghost Community with many more to follow and there is also an after show party a with a rock DJ set by Jerry Ewing. Not much info yet on this one but as I am a huge Elvis Presley fan will keep a check on it. Another big one for me as a huge fan of Belinda’s from back in the day and still have plenty of vinyl singles to prove it and this show is part of her ‘Heaven On Earth’ 30th Anniversary tour with that iconic album played in full, cannot wait. Mr Entertainment himself and another artist moving from the Assembly to the more intimate Zephyr so a good chance to get a close up look at one of live musics true characters in action. so hopefully plenty of material from the likes of 'On the Level', 'Blue For You', and Hello’. Last but definitely not least for this Marillion /Fish nut the return of the big man himself to the Assembly stage, possibly not many chances left to see him in action with rumours of future farewell tours looming. This show should mix tracks from his next studio album ‘Weltschmerz' (probably his last) together with a full 30th anniversary performance of the classic Marillion album 'Clutching at Straws’ so should be a corker. 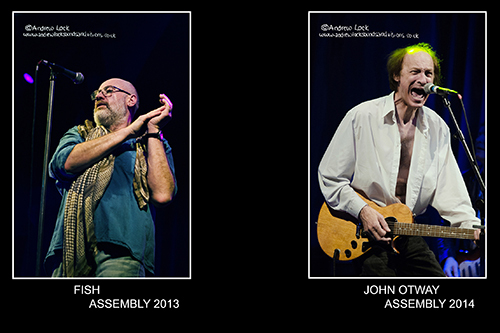 Plenty more to check out on the Assembly web site and of course new shows added regularly.